Winslow Park, in Freeport, is one of the nicest campgrounds I have seen. Suzanne and I painted there today and it was just beautiful, with a cool ocean breeze and plenty of gorgeous sunshine. I did this painting on a gatorboard panel primed with orange acrylic that Suzanne had made. It's very slick and I let lots of the orange show through (though maybe not as much as the photo shows). 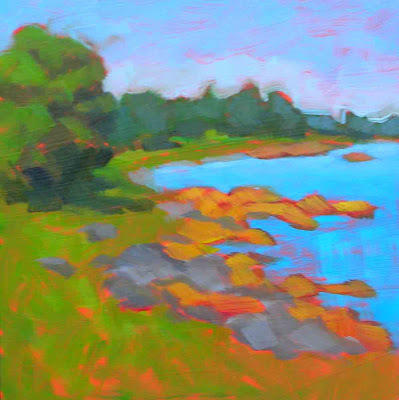 I think it was Lois Griffel who said that you can never make a painting brighter than the underpainting. I think there is something to that! 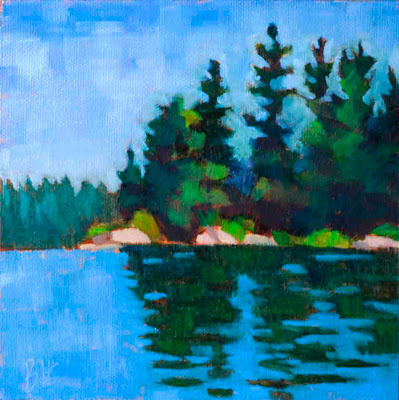 "Winslow Park" is a 6"X6" oil. For David Lobenberg's current self portrait global love in, he used my idea that we should all wear hats (or other headgear). This is my first try. Those who saw this painting today said "but you always smile, that's not how you look". Well, if you take a look at self portraits you'll find most of them have the artist staring intently at you with a frown of concentration on their face. That's because that's how you look when you spend an hour or so staring at yourself in a mirror trying to paint what you see! This was an interesting exercise. At first I was intent on creating something that looked like a person, and then I moved on to try and make it look like me. At the "looks like a person stage" I may have a had a better painting, but she was a lot younger and didn't look much like me. 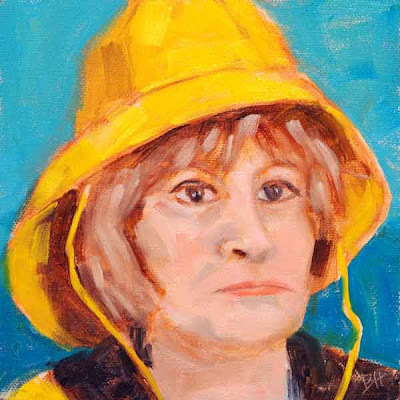 The self portrait is a 6"X6" oil. This painting was done in the afternoons of Colin's class 10 days ago. I made a few changes to the sailboat after the class, to get it into the mood of the rest of the painting. The sun was shining on the point on the north side of the harbor, and the trees and the yellow house glowed. It was gorgeous. 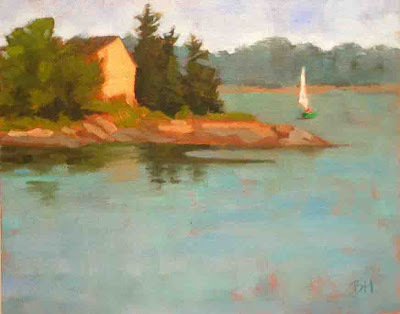 I have had a beautiful painting of this point hanging in my sun porch for some years, done by Suzanne Harden, but I had never actually been to Round Pond until taking this workshop. What fun to see the place that I had often admired in Suzanne's painting. 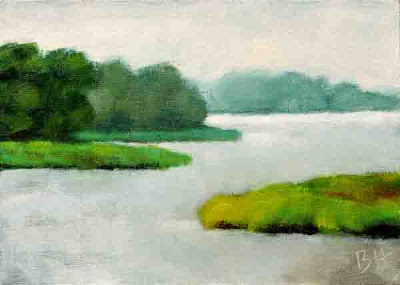 "Round Pond" is an 8"x10" oil. My friend Kristin bought the most beautiful lilies and hydrangeas on Friday for her mother's outdoor birthday party on Sunday. 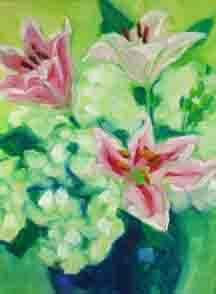 When that was canceled due to hurricane Bill, we got the pick of the lilies! I love them in this dark vase, with the different hydrangea colors. I augmented those with some from my yard and my friend Suzanne's yard, and Suzanne made the arrangement. Aren't friends wonderful? 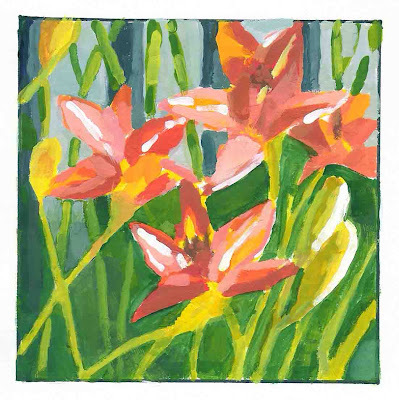 Kristin's Lilies is a 6"X8" oil. It was miserably hot in Round Pond on Sunday, but we painted anyway, everyone saying "I wouldn't be out here if we weren't painting with Colin." Talk about a bunch of hot and sweaty people! Once again we painted looking into the sun, simplifying the view across the harbor. There we houses over there, but we left them out. Colin said we all had the concept of values down pretty well, and we needed to concentrate on color temperature. Pretty funny on a day when temperature was the overriding factor. This is my study (6"x8"), scanned this time. The camera just couldn't capture this one. And let me give just a tiny testimonial to Colin and his two day workshop, now that I have taken it twice. Colin did a demo each morning, and then coached us individually as we painted. He also gave us pointers as a group a couple of times a day and we did a group critique at the end of each day. It was an exceptionally good class. I'll say it again, Colin can see things that I can't yet see. But I think with practice I can get closer to his vision. And though I doubt that you will find such an awesome group as my fellow members of this workshop (they were a friendly talented bunch), I know you would all learn something from Colin. Take a workshop from him if you get a chance. For those who like more structure, he will be teaching a 5 day class in the fall in Rockland that should give you that. It was warm but it was wonderful! 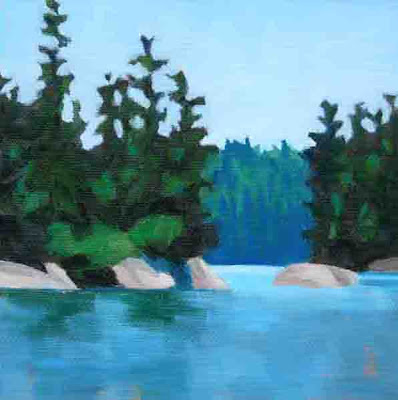 Our first of two days at Round Pond, painting with Colin Page. Colin did a superb demo of a backlit traditionally styled lobster boat and then we tried to do the same. This is my version (8"x10"). Colin is so good at critiquing, he just sees things the rest of us don't. Makes me want to get out there and paint, can't wait for tomorrow. My sister Sue's wonderful dog Max died this week at the age of 15. He was an awesome dog and such a good friend. He will be greatly missed. Sue asked me to paint a portrait of Max similar to the one I did of our dog, Macintosh, and sent me a photo. 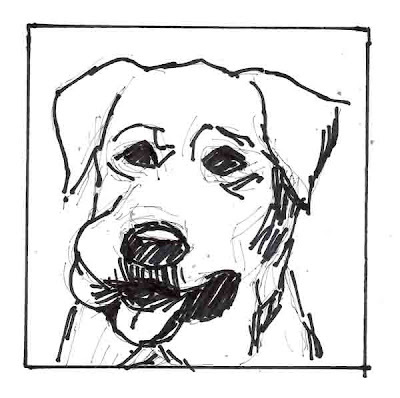 Here is a sketch of Max with a ball in his mouth, which is how we often found him. I will use it as a basis for the painting. 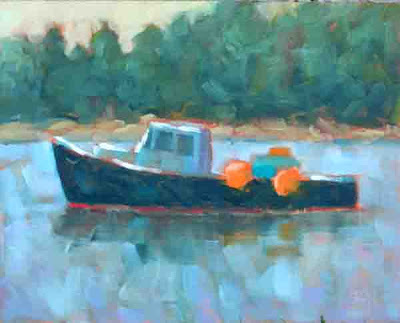 I am off to Colin Page's class in Damariscotta tomorrow and Sunday, and it looks like we will have good weather, though warm. Yeah! I have some neighbors with beautiful gardens. (I myself, got an F in gardening last year, pronounced by a good friend when she visited. You guessed it, I'd rather be painting...) This is my first attempt at "flowers where they stand", done in gouache. Once again, I am not crazy about the photo, this one was scanned. I am still in a camera dilemma, trying to figure out which one to buy. Thoughts on something small and not more than a few hundred dollars, would be appreciated. And, in case you haven't scanned the right side of the blog lately, I want to remind everyone that I will be giving away a painting a month, starting this month, based on a drawing from those who have joined as a follower, signed up for the blog email notification of posts, or submitted comments. More comments mean more chances to win. And thanks to Leslie Saeta for the wonderful idea. What a wonderful weekend, finally some beautiful summer weather. There was not much time for painting, but we got in a beautiful sail. We also said goodbye on the dock to some friends who were headed off in their boats for Seal Bay, around the bend from this picture. 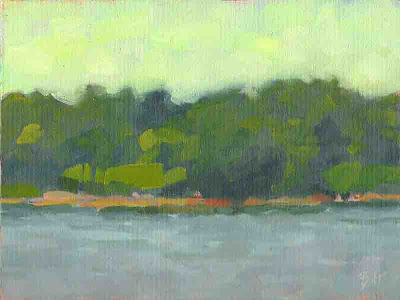 This is an oil version of the view of Vinal Cove, using the photo and value sketch as references. It was nice to be reminded of being there. For this painting I used last week's value sketch and the original photo as references. It is amazing how much less room there seems to be on a 6"X6" canvas panel with an oil brush in my hand and a 5"X5" piece of watercolor paper with gouache on the brush! Maybe I should check those brush sizes... But I finally got the drawing right. My goal was to get the values and then work on "color recession", meaning that the distant objects look that way because of their color. I think it worked! Thanks to my husband for the photo, my camera broke down completely after the photo comparison I posted a week ago on Friday. Do cameras read blogs?